The room was dark. My wife sighed softly beside me as I slowly surfaced from a deep sleep. I rolled over onto my elbow and looked at the clock, 5:45 a.m. glowed digitally back at me. In my minds eye I could still see what I had been dreaming about and I settled back on my pillow to examine my thoughts. In my dream I was designing a new fly, something that would revolutionize how streamer flies are made and fished. Oh, of course, like most flies, it borrowed successful ideas from other patterns but put them together in a new way. As I lay thinking about it I realized this might just work. My mind raced with the possibilities! The 6 a.m. alarm went off and I hit the snooze button so I could concentrate on my great idea. The more I thought about it the more feasible this fly style seemed. I had to get downstairs to my fly tying bench to see if I could tie what was in my head. I flipped on the lights and plugged in the kettle to get some hot water for the French Press. First I sketched out a rough idea of how the fly should look and by that time the water was boiling. I put fresh ground coffee in the press and poured a steaming brew. The sketch looked great and my ideas began to solidify on the necessary steps and the sequence that would be required to get this fly tied. Carrying my fresh coffee into the tying room I began to search through the drawers for the correct hooks and materials to get the job done. In tying any new pattern it is important to have a plan of the order that the materials are attached to the hook shank or you may leave out a critical component and not get your desired results. I clamped a hook into the jaws of my Renzetti vice and started winding on the thread. Thirty-five minutes and two cups of coffee later my new creation was finished. It looked awesome! I needed to get up to the lake to see how it worked in the water and, most importantly, how the fish would respond to it. As I drove to the lake my head was full of imagined savage strikes and big fish on the line. Surely this would be a new Lefty’s Deceiver or Clouser Minnow. I would be famous like Lefty and Bob. My mind was in full overdrive. To make a long story, short. My new wonder fly was a dud. It didn’t swim right at all and it twisted my leader too. I did have a fish follow it but, that was it. Was I disappointed, devastated or disillusioned? Hell no! I had a blast trying to figure out this new pattern, with a few tweaks it might still work well and there were fish around. I tied on a Clouser and caught Stripers and Largemouth Bass one after another for the next two hours. Nothing was over a pound, but it was great fun and a great way to spend a couple of hours on my day off. Keep dreamin’! I had a bunch of chores to do today but I needed at least a couple of hours on the water. I went to my home water, Castaic, and started fan casting with a small minnow imitation. Nothing doing! In my peripheral vision a coot was splashing water, he looked like he was bathing. Other than a few Silverside flashing on the surface, there was no activity that could indicate where the Bass/Stripers where feeding. As I worked my way closer to the West Ramp the coot was still very active (unlike the fish). Finally, I was a long cast away from the bird and finally I realized he was not moving and was probably tangled or hooked on some fishing line, although I could not see it from my vantage point on the shore. What to do? The bird was a long cast away but, the Rio Outbound Short Line was the perfect line to get that extra distance. I cast to the right of the bird hoping to snag the line that imprisoned the hapless bird but the fly came back clean. A long back cast and double haul powered the line to the left of the coot and after a couple of strips the line came tight. The bird started freakin' out! I realized that I had hooked whatever was imprisoning this little guy. I slow-stripped the line back in but, ten feet away, the bird, line and fly were hung on a submerged bush. Crap! Not supposed to wade. To hell with it! The entangled bird was fifteen feet away. It was hopelessly tangled! I was wading before I had made a conscious decision. I dropped my rod and grabbed the fly line, edging my way toward the trapped coot. He was much lighter than expected, weighing almost nothing and trying to hook me with his little claws. His little eyes were wide in fear. The line was wrapped around his head and the line was stretched toward the offshore bushes and was impossible to break off. I raised the tough line above the surface and bit through the taut line. The bird was freed quickly and with a quick toss the little guy was free. After a short flight he was paddling toward his brethren and muttering about his misadventure. Everyday on the water is a new experience and, if I had decided to stay home, this little life would have been snuffed out without anyone knowing. Tell your fishing friends not to discard their monofilament. Wrap it up and take it home so that our precious wildlife is not exposed to this type of hazard. Their real world is tough enough. The towering red cliffs of the Glen Canyon cast a welcome shadow on the clear green waters of the Colorado River. At 15,000 CFS and 55 degrees the powerful flows, are still very wadeable. The trout are everywhere, from the base of the massive Glen Canyon Dam, all the way into the beginnings of the Grand Canyon itself. Fine wild rainbows from a few inches long to some burly 18”-20” specimens that will rip line off your reel and make you wonder if they’re going to stop any time soon. They have a constant supply of midges, gammarus shrimp and annelid worms that are carried to them in the clear currents. Limited access ensures that these fish can feed and grow without undue pressure. Other than the walk in section the only access is by boat and, because of shifting gravel bars, the guides who fish this river every day prefer jet boats. Steve and I were at Lee’s Ferry for a dealer meeting with the Orvis Company and we had planned an additional day to fish with the fine guides from Lee’s Ferry Anglers. We stayed at Marble Canyon Lodge and enjoyed our meals at the great little restaurant across the dirt parking lot from the fly shop. Owners Wendy and Terry Gunn are long time friends and it was fun to get together and reminisce about good times and old friends. Lee’s Ferry Anglers has been guiding in this are since the 80s and have seen the river go through a few changes. After some down years the river has made a great comeback in the past few years and multiple good spawns bode well for the future. 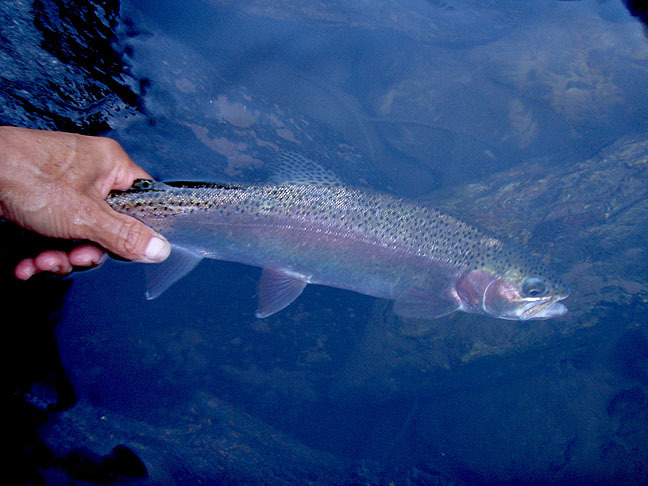 It is very fine fishery with a huge number of wild rainbows in all sizes that eagerly slam the fly and fight hard in the swift currents. While dry fly fishing can at times be outstanding, this is primarily a nymphing river where midge pupae, scud patterns (olive and orange) and San Juan worms (tan and red) will get tagged on almost every drift. Dry dropper and standard indicator rigs should be used to bounce the appropriate patterns along the bottom. We fished a dry dropper rig and had action all day long with fish to 18” landed and several broad shoulders models hooked and lost. I hooked one of the hottest fish that I have ever hooked in fresh water and she proceeded to tear all the fly line and fifteen yards of backing off my reel and rip the tiny size 20 Zebra midge out just as the guide was about to put the net under her. Too bad! She would have made a pretty picture. This fishery is about a nine hour drive away (perfect for a long weekend) and because of the awesome scenery and fast action is highly recommended. Call us if you would like more info on this great destination.